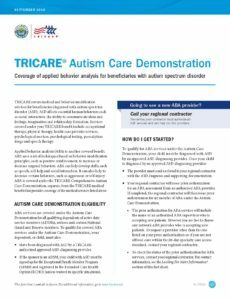 We provide ABA services to both active duty and non-active duty military personnel, including retirees, through the Comprehensive Autism Care Demonstration (ACD). This coverage includes a functional behavioral assessment, development of an initial behavioral treatment plan, and analysis and updates of the plan. ABA services are provided by Board Certified clinicians and include: direct treatment, supervision of behavior technicians and family/caregiver training.